We are back renting again as we had to take the listing off for 3 years due to permitting process which we are now a legal Vacation Rental. 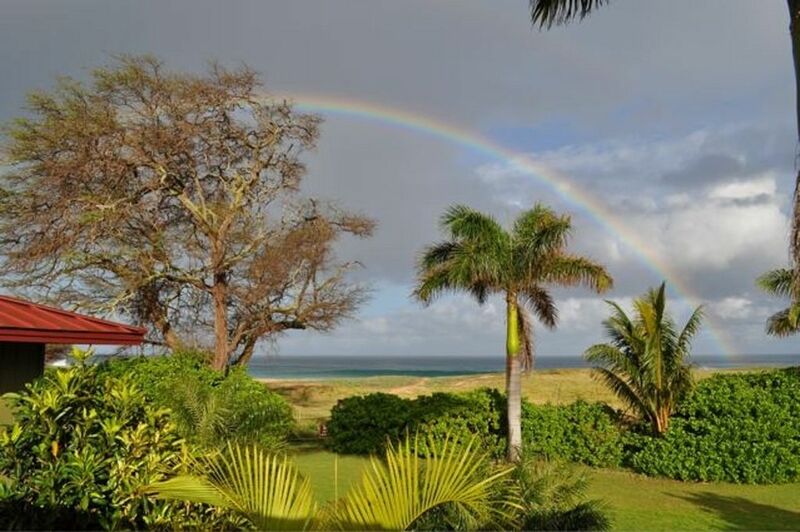 Located beachfront on three mile long Papohaku Beach, this large 3 bedroom,4 bath, 3 full size living room Hawaiian home is ideally suited for family vacations. Three separate private suites, with the master bedroom which overlooks the ocean. Two large decks on the ocean side practically place you at the ocean's break, which makes whale watching, sunset viewing, and outdoor meals convenient. Our home is decorated with commissioned hand-painted furniture, wall murals and paintings. It is designed to be a comfortable, relaxed private setting. Molokai is uniquely Hawaiian, unspoiled by oversized resorts. The town of Kaunakakai, Molokai’s largest, is a throwback to a previous time, with simple old Hawaiian shops and friendly people. The West End beaches are among the finest in Hawaii and yet have very few visitors. Local snorkeling, fishing and mountain biking are superb. Day trips to the national historic park of Kalaupapa and Father Damien’s original missions, the Nature Conservancy’s Mo’omomi Beach and Kamoku Preserve, and the lush Halawa Valley are highlights of many visits. Above all Molokai offers privacy, serenity, and a sense of old Hawaii not available on any of the other islands. Step right out to the beach for the beautiful sunsets! We had a great week at the house. Liana and Tim were very responsive and available. We loved the beach and getting away from it all. We'll be back! The accommodations are delux from the cozy beds to the fully stocked kitchen. As one who loves to cook I can say everything is there! We enjoyed the jumbo size grill cooking surf and turf almost every night. This home is paradise for relaxation with the jacuzzi and pool right out front - a treat after a full day of fun on the island. more like our personal concierge ensuring that we had everything we needed. From the time he waited for us out front the evening we arrived, to the group photos he took of us all under the massive banyan tree patio- we just fell in love with concierge Topher. I haved booked many home away homes but never had I had such a personable experience due to Topher’s hospitality and this spectacular dream house! His knowledge of the area; where to shop, restaurants (we all love sushi), hiking trails (the secret ones) was such a godsend. We all wanted to take him home with us as he is such a gem. The walk to the beach so close was handy as many a time I’d announce to my family ‘I’m going to run back and make some sandwiches, or blend up some margaritas which would be frothy cold and enjoyable on the beautiful pristine Lanikai Beach in the afternoon. This home, and Topher have somewhat ruined me for any future trips as I suspect nothing can top our experience there. The house and property and beautiful. The property is oceanfront and the beach is not busy at all. Liana, the property manager, is very kind and welcoming. Will definitely stay here on our next vacation to Molokai. This is great house for a family or group to just relax and enjoy the beautiful scenery of Molokai. The kitchen is well stocked and you will have everything you need for a fun time in the tropics! What an amazing house and location! If you are looking for isolation and solitude, this is the island and house for you! We have been to Kauai and the Big Island (we like the quiet), but this island really brings out the vacation mode in you! The house is huge. HUGE! Every room has a great view of green lush vegetation with the ocean and blue sky setting a beautiful backdrop. Every room has numerous seating opportunities, ceiling fans, and in the livingrooms (note roomS) windows that go from the floor to the ceiling. The breeze gets pulled through the house fantastically. We were never hot! The kitchen was well stocked, easy to cook on the stove, dishwasher was huge, nice refrigerator’s (we only needed one), and plenty of space (floor and counter!). The bathrooms were great too. Walk in shower in the master bedrooms, and a walk in closet. The bed was a little hard for my taste, but that didn’t stop me from getting 9 hours of sleep every night.  The house is extremely clean and well taken care of! We thoroughly enjoyed eating on the deck for breakfast and dinner. After dinner, watching the geckos eat moths around the lights. VERY FUNNY! No TV for us! Lots of toads and giant snails too around at night. We did see 2 cockroaches. Yes, only 2!! (the Big Island … that is a very different story!) I think the free range chickens take care of a lot of the bugs. Good girls! The ocean is just a short walk away. We had a spectacular view of the sunset every night from what felt like our own beach! Seriously – there were maybe 4 people on the beach each evening. A few times there were just us! Unfortunately we were not able to swim in the ocean at our beach – the week we were there was a high surf warning. That current would eat you up if you went out there! But the crashing waves did make for a great sound spa at night. There is another beach a short drive away, but unfortunately that was solid red and dirty from the high tide pulling in dirt from the streams. But the entire south shore was red from whatever event occurred, so really no snorkeling or swimming for us this year. No worries though- we still got tan, still relaxed, and still enjoyed every second of our stay here! Very excited to come back! Molokai's West End has some of the best unspoiled beaches in the world.